Chord Sender is a device which follows pitch information in a Live clip to send root note a scale/ chord information to ScaleBots. If the Remote button on the ScaleBot is switched on, the scales it uses will follow those being broadcast by chord sender. 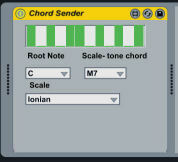 At the moment, only one instance of chord sender is required per Live Set. To automate the chord sender, open up a clip in the same slot as the module. Then enter notes of pitch between C3 and B3 to set the root note (C-B). Then enter notes in the octaves above to control the choice of chord/ scale. Pitch Set: Notes in current scale from C to B – display only. This shows the group of scales available to chord sender. This can be automated by setting notes C4-B5 (numbers 0 -23 in menu). This represents a II-V-I-IV sequence in C major, so the chords are D minor 7 (D Dorian scale), G 7 (G Mixolydian), C major 7 (C Ionian) and F major 7#4 (F Locrian). The pitches used to trigger the various scale/ chords are shown in the table below. Altering the scale menu changes the Chord Menu and vice versa. For nwdlbots, chords and scales are two aspects of the same thing! I usually put chord sender in slot zero next to Noodle Control without an instrument in the slot. Music made by these clips can sound decidedly weird.